The Modern PPTQ season starts this weekend for me. Just like last year, I will be documenting my grind for the RPTQ invite, with all the lessons learned and deck tweaks that entails. Hopefully this edition doesn’t go the whole season, but that’s Magic. In this kick-off article, I will be examining the metagame with an eye to my deck selection. While PPTQs are highly local affairs, the analysis present in this piece seeks to provide a blueprint for applying known metagame factors to deck selection. There is a difference between the “true” global metagame and the local metagame. The smaller the data set, the more likely that outliers will strongly affect the analysis. That one guy at your local game shop who insists his Mesa Enchantress combo deck is busted despite substantial contrary evidence is meaningless to the real metagame, but may be worth accounting for locally. In my case, I know that I will be facing grinders who take metagame statistics seriously. I will also face players who only play one or two decks no matter what the metagame does. This situation creates a lot of tension in my deck choice. The global metagame is in flux, but what that means is hard to determine. Tracking the metagame in the run-up to GP Las Vegas showed Humans functioning as the center of gravity around which the format was constantly evolving and shifting. Since then, things have gotten hard to read. Vegas was dominated by colorless decks. GP Barcelona was packed with UW control decks, but won by Dredge. The same weekend, SCG Atlanta saw Infect win in an incredibly diverse field. 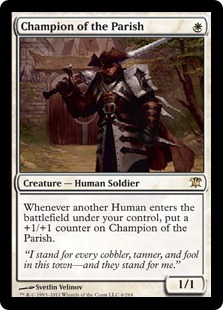 This past weekend, Bogles won the SCG Worcester Classic in a field where Cheeri0s came third. Mardu Pyromancer somehow blew through all the colorless and Primeval Titan decks to win GP Sao Paulo. Humans was just another deck at all these events, frequently not appearing in the Top 16. On the surface, it certainly appears that Humans’s time as deck-to-beat is over. However, that isn’t necessarily true. The metagame aggregations show Humans still near the top, commanding roughly the same percentages as it has since the Pro Tour. The metagame is moving, there’s no denying that, but where and how large that shift is depends on where you look. Currently, MTGTop8 shows UWx Control on top with 11% of the metagame. MTGGoldfish says Tron is on top with 6%, though that’s primarily MTGO based. This reddit compilation shows Humans still on top. Then there’s Ironwork’s excellent Day 2 conversion from Sao Paulo. The picture is incredibly muddy. If Humans isn’t rising to the top of big events, that could be because players are prepared for Humans and Day 2 is increasingly hostile. It may have no impact on the Top 16, but Humans had a very good Day 2 conversion in Sao Paulo. There’s little evidence to say that the actual metagame has substantially changed. However, given Ironworks’s (or maybe just Matt Nass’s) recent rise, the aforementioned return of Infect in Atlanta, and the fact that no deck has won multiple events, it is safe to say that Modern is diversifying. As long as Humans is taken into consideration, any deck can be viable. I know plenty of metagamers who will be taking advantage of this idea. Of course, what this situation actually means for the PPTQ season is nebulous, as it’s difficult to measure the local metagame scientifically. It’s easy enough to see said metagame by attending local events, but that’s just the one store. For the other stores, I have to rely on asking around and my knowledge of the preferences of my fellow grinders. This data gap leaves a lot of unknowns, but this year, the picture I’ve received is very consistent. Based on observations, personal and second hand, the most played decks in the Denver area are Tron variants, Elves, Burn, and various blue based control decks, particularly UW. Affinity, Collected Company decks, Grixis Shadow, and various graveyard value decks are frequent contributors. I also know that many grinders gravitate to Jund and Burn when there’s no clear best deck in the overall metagame. There are also several that play whatever deck is the flavor of the month, which right now is either Ironworks or Infect. Finally, there is always a cabal of prison players. Sometimes they’re on Enduring Ideal decks, sometimes it’s Blood Moon, but every year they show up to the first few events hoping to hide behind Ensnaring Bridge to victory. To me, that’s a clear metagame read. The top decks are well known, and I can prepare accordingly. Humans doesn’t see much play in Denver, perhaps due to the popularity of control and Elves. Thus, I expect more power-card decks like Elves and Affinity than dedicated go-wide aggro strategies. This means that interaction will be essential unless I can reliably race Affinity and it’s especially true against Tron. My strategy against control is always to go for the kill, and I prefer aggressive decks so that isn’t a concern. I also need to have answers for prison cards, at least initially. Given the potential field graveyard hate is essential, and I want Stony Silence. I’ve played a lot of decks over the years, but only a few are serious considerations right now. Both my old standbys, Merfolk and Death & Taxes, have terrible Elves matchups. I can fix that for Merfolk with Hibernation, but I can’t fix the UW Control matchup. Merfolk doesn’t do well against multiple sweepers alongside Field of Ruin for Mutavault. D&T has a better time with all its two-for-ones, but it’s still not favored. Merfolk has the additional problem that its only plan game 1 against combo is to race, which isn’t reliable enough for me. Tron was good for D&T, but the local players have been maxing out on sideboard sweepers recently, and it’s become even at best. This leaves me with Jeskai Tempo, Storm, and UW Spirits as plausible candidates for this weekend. I haven’t decided on one; I’m very likely to turn up with all three decks and pick at the last minute based on scouting. My default deck for this season will almost certainly be Jeskai Tempo. I’ve been playing it the most of all my decks this year, and have had considerable success. Had I gone to GP Las Vegas I would have run this deck, and in fact I haven’t felt the need to substantially change anything since testing for Vegas. I adopted the changes I was considering after the tournament and have been very happy. The extra Dispel has benefits beyond control matchups, specifically Burn and Storm. The only disappointment has been Spell Snare. Even in control matchups, it underperforms, and I will almost certainly be cutting my copies for hate cards. In addition to my experience with the deck, Jeskai has very good matchups against Elves, Burn, Collected Company, and Affinity. The deck is full of removal and Lightning Helix, and can adjust to being a true control deck. The problem is Tron. Even when I ran Blood Moon, that matchup was poor at best. The additional sweepers Tron’s running now have made the Geist plan questionable, and I really don’t have an alternative plan. That’s a very big negative. I built Storm a few months back mostly because I realized I owned the whole deck, but also because Tron was everywhere and Storm devastates ramp decks. After all, Modern rewards having a completely different style of deck for when the metagame gets hostile. My deck differs from mainstream builds, but it’s worked very well for me. The only change I’ve made since I first built the deck is to switch a Remand for Unsubstantiate. I never liked Noxious Revival since it always felt like empty storm count; there were too many Opts and I wanted ways to not just die to Humans, so I cut Revival for Abrade. It’s been an exceptional card an won many games I may have lost otherwise. Vandalblast was picked because for a time Lantern Control was really popular, but these days it could easily be Shattering Spree. As for this season, Storm is Storm, with all the good and bad that entails. Hate, especially Damping Sphere, is a concern given the popularity of Tron, but that’s what Abrade is for. I’m not an expert Storm player, but you also don’t need to be against Tron. I doubt that I’ll go into any PPTQ intending to try and spike with Storm, but I’ll keep it in the wings for the right field. Finally, there’s the deck that I most want to play, but haven’t actually finalized. I spent most of last season running UW Spirits because it was a great Chalice of the Void deck and the field was mainly control and Shadow. I ran roughshod over the Swiss rounds, but kept falling in the finals to decks that didn’t care about Chalice. Supreme Phantom promised to make Spirits into a real deck, and the early indications are that it’s a promise it can keep. This deck is a huge control killer, even without Chalice. Bant is better against midrange decks like Jund thanks to Company, but against control, UW is king. The creatures are very hard to interact with, and the only sweeper that can’t be efficiently answered is the unpopular Terminus. I was surprised, but Elves is a pretty good matchup for this deck. Spirits can answer Company and Chord with Mausoleum Wanderer, and Spell Queller snags every payoff card in the deck. Tron is also a far better matchup now. The extra two drop in Phantom means that dropping a couple threats and then Ghost Quartering Tron repeatedly is a solid strategy. Burn’s a little dodgy, but can be fixed with sideboard cards like Kor Firewalker or even Azorius Herald. The main problem is that I haven’t found a final configuration I like. The four flex slots currently occupied by Geist and Curious Obsession are up in the air, as nothing has really impressed. Geist is good, especially with a lord, but it doesn’t amaze. Obsession has been great when placed on Geist against control, but pretty mediocre every other time. Nebelgast Herald is okay, but ineffective against Elves and Burn; the former because Elves goes for huge damage chunks, not races; the latter because by the time Herald hits, Burn’s creatures have done their job. Reflector Mage was better, but not exceptional. I really like the deck otherwise, even if the sideboard needs work, and I hope to have something I like by Saturday. However, if it’s not ready, it’s not ready, and I’ll play something else. Having the most PPTQ second-place finishes in the state is not a record I hold with pride. Here’s hoping this year is more like 2016, when I effortlessly cruised to an invite. Good luck to everyone, and next week we’ll all see how it went. Options are nice, but I’m locking myself into the same deck I’ve played all year (I mean it’s burn nothing crazy). Field is looking to be heavy on mardu, Pittsburgh has a big scene and a lot of players would prefer to leverage their knowledge and skill with midrange and control. So I’m basically betting on a close matchup against the most popular decks while hoping to run into a couple of ramp decks that are preying on those. I’ve only played one PPTQ before, so this would make the first season I really dive in. Should be exciting, good luck! Hey David, great write up as always. As a U/W fish player I’d like to be prepared for as broad a field as possible. I’m headed to Gencon in the beginning of August and researching the region is a bit too tough for that kind of event for me, so I’m just sorta hoping to shore up my weaker match-ups. I think the threat of sweepers in u/w/x decks is obviously a problem, so I’m running 2 selfless spirits and an eerie interlude in my board. For affinity I’m running 2 stonys and 2 ceremonious rejections. 3 Rest in Peace for gy hate and KCI. The last five would usually be 3 deprives and two spellskites. I know that I’m a dog to elves, are they worth shaking the board up for with hibernation, or should I just hope to dodge them? I’d treat a convention like GenCon the same as a GP and assume that it will be a fairly accurate slice of the overall metagame. Unless something drastically changes in the next few weeks, Elves is not a big enough percentage of the metagame to worry about so I’d go in hoping to dodge. Hibernation does have value against Bogles and random green aggro and/or devotion decks, so if you have a slot that’s pretty weak it’s not a bad card. There’s just a high likelihood it will never be used. Is uwr tempo’s Tron match that good for you, David? I’d expect something for them in the 15(say, where the spell snares are). Tron’s prevalent at my LGS(all flavours), so I’m hesistant to rep tempo. Nah, it’s bad. It was ok for a while because Geist into counters was fast enough, but locally they’re all on GR with all the sweepers so that doesn’t work anymore. If Tron was still mono-green that would be a different story. Okay, I’m not crazy haha. UW will probably be a good choice for my meta then. The main reason is that Mutavault isn’t evasive. In Merfolk the lords pump vault and give islandwalk so it doesn’t matter. In Spirits vault does still get pumped, but then it has to contend with opposing ground pounders which are usually bigger. Therefore it doesn’t actually help Spirits go wide on the attack or spread opposing resources. The main secondary reason is that it’s not necessary. Mutavault is primarily meant for grindy matchups as a way to dodge sorcery speed removal. Spirits, played well, is pretty insulated from sorceries and dominates control. Mutavault doesn’t add anything to that. The other reason is that Ghost Quarter is far better because it’s incredible in a lot of tricky matchups.